Tato kniha umožòuje pokroèilým studentùm procvièit si slovní zásobu v pøirozeném kontextu. Je vhodná pro využití ve tøídách i pro samostudium. 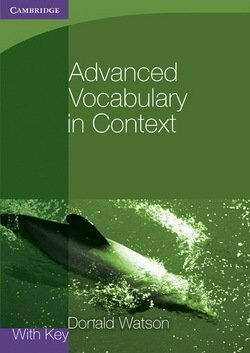 This book enables advanced level students to practise vocabulary in natural contexts. It is suitable for use in the classroom, for homework, or for self-study. The book develops an awareness of collocation, and prepares for gap-filling sections in examinations such as Cambridge CAE and CPE, as well as providing a rich source of stimulating reading material. Key features include: 24 authentic texts from quality newspapers and magazines, on stimulating contemporary topics; texts gapped for completion with 40-50 words listed separately and preliminary exercises which review pages after each group of six units. The With Key version contains an answer key.